2002 Prague, in the now Czech Republic, was inundated by flood waters. Many people lost their lives. During reconstruction someone found something fascinating behind a collapsed wall in the basement. A laboratory with great historical and scientific significance! It is believed to have been commissioned under the rule of Holy Roman Emperor Rudolf II. Himself a loyal devotee and practitioner of The Occult Sciences. Preoccupied with such, that historians believed that the political disasters under his reign led to the Thirty Years’ War. Rudolf II was a humanist, a botanist, a natural philosopher, a patron and collector of fine arts. He commissioned decorative objects of all kinds and in particular mechanical moving devices. Ceremonial swords and musical instruments, clocks, water works, astrolabes, compasses, telescopes and other scientific instruments. John Dee, adviser to Queen Elizibeth I, magician, scryer, diviner, astrologer, Hermetic Philosopher. Along with his companion, intermediary Edward Kelley, in their words, channelled The Enochian Language, or language of the angels. Judah Loew ben Bezalel (Rabbi Loew) and his infamous Golem of Prague . Rudolf II allegedly purchased, an enigma to this day, The Voynich Manuscript. I find this portrait of Rudolf quite interesting. I’m sure I have lost a few by now, but I find the history of the building VERY interesting. 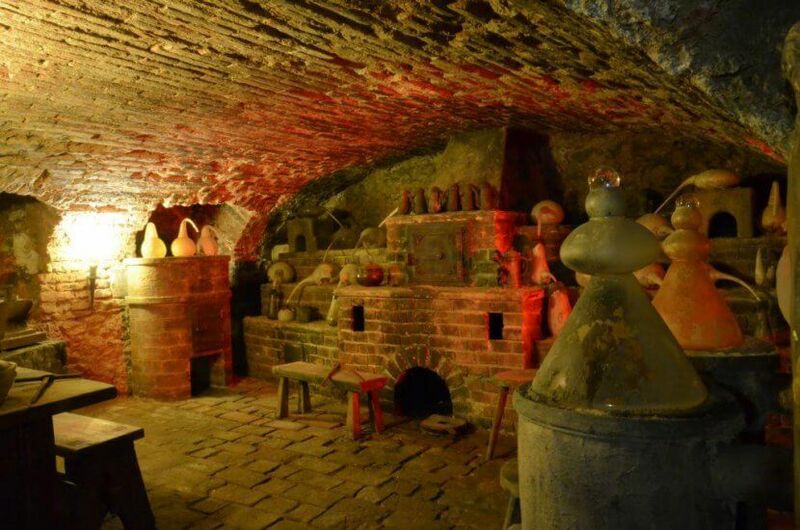 It has records dating back to 900 AD and is believed to be the second oldest building in Prague with underground tunnels that connected the three most important places in the city – Prague Castle, the Old Town Hall and Barracks. It was curiously saved in the destruction of the Jewish Ghetto in Old Town Prague in the 19th century and is now a museum. Much of the display is recreated….but if walls could talk!